Triangular right angle weave ring tutorial. This ring is a piece of the Annie collection. 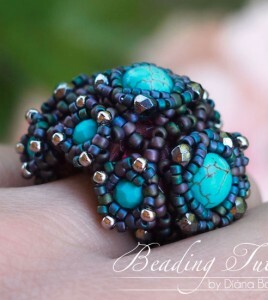 The beads around emphasize the chaton or the bead in the middle, and give nice appearance for the ring. The Baroness beaded bead is the twin of the HEXA bracelet. 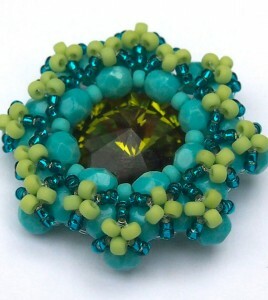 The Baroness beaded bead made with a special RAW (right-angle-weave) stitch: with triangle weave stitch. this is a really 3 dimensional creation, with a lot of seed beads. Thanks to the special structure looks like a lace bead. I made the HEXA bracelet with a special RAW (right-angle-weave) stitch: with triangle weave stitch. The bracelet is really a 3 dimensional creation, with a lot of seed beads. Thanks to it’s special structure the HEXA looks like a lace ribbon. You find the first three dimensions in the space surrounding you. The fourth dimension is the time. I’m a beadworker, and for me exists another dimension: THE BEADING. This is for me the FIFTH DIMENSION. Although the four dimensions exists together, if I’m in my fifth dimension, space and the time ceases to exist for me. So I’m in a spaceless and timeless “state”, and this is CREATIVE BEADING. Beading tutorial Annie Donut pendant, with RAW (Right Angle Weave) and TAW (Triangle Weave) technique. This is an easy to make pendant, but I don’t recommend for absolute beginner. Beading tutorial Annie pendant, with RAW (Right Angle Weave) and TAW (Triangle Weave) technique. This is an easy to make pendant, but I don’t recommend for absolute beginner. The beads around emphasize the rivoli, and give nice appearance for the pendant. Beatrix is a simple and elegant necklace with beaded beads, using CRAW and triangle weave techniques, for advanced bead weavers. Following this tutorial you can learn how to make a triangle weave hexagon, and how to turn the hexagons into elegant Swarovski crystal earrings. I wrote this tutorial for absolute beginners. I am fond of crystals. I love the radiance of every single crystal bead. 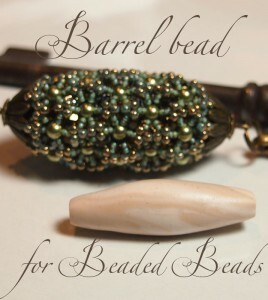 I like to work with these beads, to create jewelries from them, in which their shine is summarised. 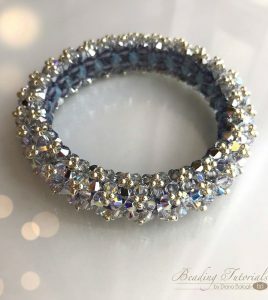 I created this royal bracelet from almost 400 Swarovski bicone crystals, and I recommend it to you, if you love the glistering of crystals as much as I do. Neither the photos nor the video can represent very well the true beauty of this bracelet. Simple, elegant and easy to make beaded bracelet with triangle weave technique for BEGINNERS! I recommend this tutorial to my free Triangle weave lesson 2. The Renaissance cross pendant is based on czech fire-polished beads, decorated with japanese Toho seed beads. 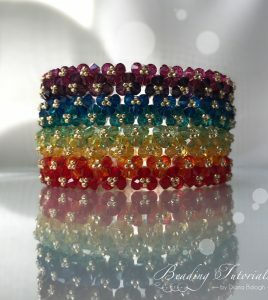 This is an easy-to-make beading project, a simple triangle weave bracelet, using colorful Swarovski crystals as embellishment. I used two vibrant colors for each bangle – hence the name: Twins. If you make more pieces from them, you can use them as “twin bracelets”. And I definitely suggest you to create more of them, because it looks better on your hand, if you have 2, 3, 4,… or up to 10 pieces. Easy triangle weave bracelet tutorial for absolute beginners. 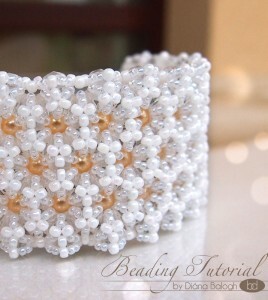 Free beading tutorial to the Triangle weave lesson 1. Simple and beautiful triangle weave beading project. 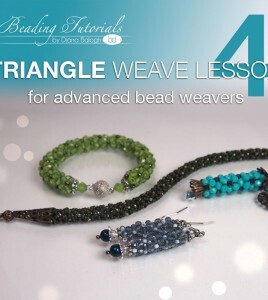 I recommend this tutorial to my free Triangle weave lesson 2.